Seeing that I work as a consulting engineer, with most of my clients being US Government agencies, it seems that every single June I need to go down to the DC area for a business meeting (so far this month, I’ve had 5 DC-area meetings scheduled, although I’ve so far managed to keep them combined into just two trips). Usually I end up staying in either Crystal City or Ballston, but I’ve done it enough times that I’ve got some regular traditions. Two of these involve the efforts of one DC restaurateur: On different visits I tend to alternate between getting a really good burger at Ray’s (you can read my review of the now-closed Ray’s Hell Burger, but their similar Ray’s to the Third restaurant across the street at 1650 Wilson is still alive and well), or going to get a steak at Ray’s The Steaks. Ray’s The Steaks is an interesting place. The original Ray’s was opened in 2002 by DC chef Michael Landrum, in the small strip mall that I’ve often called the gourmet ghetto (the other tenants include the famous Pho 75). The idea was quite simple: take a relatively bare-bones location (a strip mall restaurant), and sell a bunch of really good steaks and other high-end meat cuts and a good wine list, and doing so with relatively simple service approach, focusing on the meat. The result was Ray’s The Steaks, which got a reputation as one of the DC area’s better steakhouses, with a relatively good quality-to-price ratio. And it was quite a success, soon Ray’s was very difficult to get into without a reservation, and in 2009, they ended up having to move to a much larger space by Courthouse Metro at the Navy Building at 2300 Wilson (and, in 2012, expanding that space into the suite next door). Meanwhile, the older Ray’s space was redone as a Ray’s Hell Burger (which closed earlier this year, as mentioned above, but other various Ray’s restaurants live on). But Ray’s continues to offer a rather attractive menu of steaks, with their current location having moved up from “no frills” to “tasteful but sparse” in the decoration front. The menu at Ray’s the Steaks is actually quite simple in concept: it’s basically steaks. A rather lot of steaks, ranging from the basic cuts (sirloins, rib-eyes, porterhouses), to unusual cuts (Brazilian strips), to the butcher cuts (hanger steaks and such), to various dry-aged specials. All served up with basic presentation, with mashed potatoes and creamed spinach for the table (plus a few other sides like mushrooms, if so desired). Digging around on the menu will also yield a small handful of fish dishes, and perhaps even something vegetarian, but 95% of the menu is, well, steaks. And I almost always get one of two items at Ray’s, the hanger steak (and, thankfully, Ray’s knows how spell that… I’m tired of steak places offering up a “hangar steak”, which I shouldn’t be offered unless dining under a parked aircraft), and the 40 day dry-aged Delmonico. 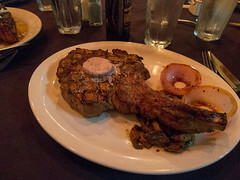 This time I opted for the latter, which came as a rather substantial slab of meat, garnished with truffle butter, and a laughably small garnish of onion and mushrooms. The steak was rich, flavorful, and very tender, and prepared to a perfect “medium rare”. This was one of the best steaks I’ve had in the last year, and at $38.50, one of the best steak values I’ve had. Ray’s has some minor issues: It can be very busy, the service is somewhat perfunctory, and the menu options are limited if you are looking for something other than steak. But if you are looking for a great streak, and aren’t requiring high-end service or a broad menu, it’s quite a great place to dine. The next day in London, we decided to go on a walking tour of the London Underground from London Walks, which was a rather insightful romp through Baker Street, King’s Cross, Covent Garden, Leicester Square, Embankment, and Westminster Tube stations, and one I highly recommend. But at the end of our tour, we found ourselves by Piccadilly Circus and hungry for lunch. With the fond memories of our trip to Bone Daddies still fresh in our head, we were again hungry for Ramen. This time we checked out Shoryu, who has one location a short walk from the Circus.